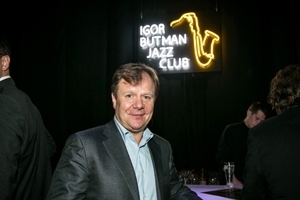 American University students are invited to an evening of unforgettable music with Russia's number one jazz personality and saxophone virtuoso, Igor Butman, and his jazz band on October 22. Butman has performed with Dave Brubeck, Chick Corea, Pat Metheny, Gary Burton, Louis Bellson, Grover Washington, Jr., and Wynton Marsalis, amongst many others. According to President Bill Clinton, Butman "may be the greatest living jazz saxophone player, who happens to be a Russian." This event at the Russian Embassy is free and open to all AU and DC Consortium undergraduate and graduate students, with their guests. It is sponsored by American University's Carmel Institute of Russian Culture and History. All attendees must RSVP individually with full names and full birth dates via CarmelInstitute@american.edu by 10:00 a.m. on Tuesday, October 20. Please include your school affiliation and graduate or undergraduate status. All guests must bring government-issued photo identification and the RSVP confirmation email they receive from the Carmel Institute verifying their registration for the event. Business attire is required. Transportation from AU, Georgetown University, George Washington University, University of Maryland, College Park, and University of Maryland, Baltimore County has been arranged. Please see below for pick-up times and locations. Please note that you will enter the embassy through the Wisconsin Avenue gate, at 2650 Wisconsin Ave ., NW. Times listed below are departure times. Please be at the pick-up location before the departure time. Universities do not always allow our drivers to park for any period of time, so the bus may be only on-site for a brief time to load the waiting passengers. Return shuttles will leave the embassy at or soon after 9:45 p .m. Please find your bus on Edmunds St., NW (across Wisconsin Ave., NW, from the Embassy entrance) in time to board by 9:45 p .m.